It may not have the pulling power of bigger shows, but California Extreme remains one of the best arcade events on the gaming calendar, luring in attendees from the Bay Area (and beyond!) to play hundreds of great old coin-op machines. Held over the weekend at the Hyatt Regency in Santa Clara, California, the 2011 event saw around 400 arcade games (full list here) and pinball machines from all eras and generations on-hand to play, some of them rare, some of them modified, some even being unreleased prototypes. The best part? 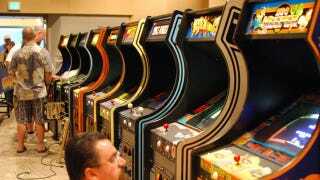 Every machine was set on free to play mode, so your quarters were safe from harm. You can see a walkthrough video of the show floor (as it's being set up) here, while KLOV have a great gallery of pics up showing the weird and wonderful games on display.